NCERT Textbook Solutions are considered extremely helpful when preparing for your CBSE Class 7 Science exams. TopperLearning study resources infuse profound knowledge, and our Textbook Solutions compiled by our subject experts are no different. Here you will find all the answers to the NCERT textbook questions of Chapter 4 - Heat. All our solutions for Chapter 4 - Heat are prepared considering the latest CBSE syllabus, and they are amended from time to time. Our free NCERT Textbook Solutions for CBSE Class 7 Science will strengthen your fundamentals in this chapter and can help you to score more marks in the examination. Refer to our Textbook Solutions any time, while doing your homework or while preparing for the exam. (i) Both consist a long, narrow, uniform glass tube. (ii) Both have a bulb at one end. (iii) Both contains mercury in the bulb. (iv) Both contain Celsius scale on the glass tube. Temperature range is from 35°C to 42°C. Temperature range is from – 10°C to 110°C. It is used to measure temperature of human body. It is used to measure temperature in experiments performed in laboratory. It has a kink which prevents the immediate back flow of mercury. Usually, it does not have a kink. Concept insight: Conductors are the objects which allow heat to pass through them easily. Insulators are the objects which do not allow heat to pass through them easily. Concept insight: Laboratory thermometer is used to measure temperature of boiling water. Concept insight: Temperature is expressed in the unit of 'degree celsius'. Concept insight: Heat can be transferred by radiation even through vacuum. Concept insight: Conduction is the process of heat transfer from hotter part to colder part without the movement of material as a whole. Concept insight: Dark coloured clothes absorb more heat radiations while light coloured clothes reflect most of the heat radiations that fall on them. Land breeze blows from the land towards the sea during the night when sea-water is hotter than the land. Sea breeze blows from the sea towards the land during day time when the land is hotter than the sea. Dark coloured clothes absorb more heat rays from sun and keep us warm during winter. Light coloured clothes absorb less heat rays from sun and keep us cool during summer. Wearing more layers of clothing than wearing one thick piece of clothing keeps us warmer because air gets trapped in between the two layers of clothes. As air is a bad conductor of heat so it does not allow body heat to be lost to the environment. Concept insight: Air is a bad conductor of heat. (i) Transfer of heat from hot plate to pan is by conduction. (ii) Transfer of heat within water is by convection. (iii) Transfer of heat from hot bodies like pan, plate, burner etc. to the surroundings is by radiation. Concept insight: There are three methods of heat transfer - conduction, convection and radiation. Conduction and convection need material medium but radiation does not need any material medium. In places of hot climate, it is advised to paint the outer walls of houses as white because a light colour such as white reflects back most of the heat that falls on it. We can say that it absorbs less amount of heat and keeps the house cool. Concept insight: White colour is a poor absorber of heat and very good reflector of heat. (d) The temperature of the mixture will be between 30°C and 50°C. Concept insight: Heat gained by cold water will be equal to the lost by hot water such that the final temperature of the mixture will be between 30°C and 50°C. (b) The heat will not flow from iron ball to water or from water to iron ball as both the substances have same temperature. Concept insight: Heat flow takes place from a hot body to a cold body. As both water and iron ball have the same temperature, so there is no temperature difference between the two for heat flow to take place. (d) Its other end does not become cold as wood is a bad conductor of heat. Concept insight: A bad conductor does allow heat to pass through it. (c) The reason for this is that copper is a better conductor of heat than stainless steel. 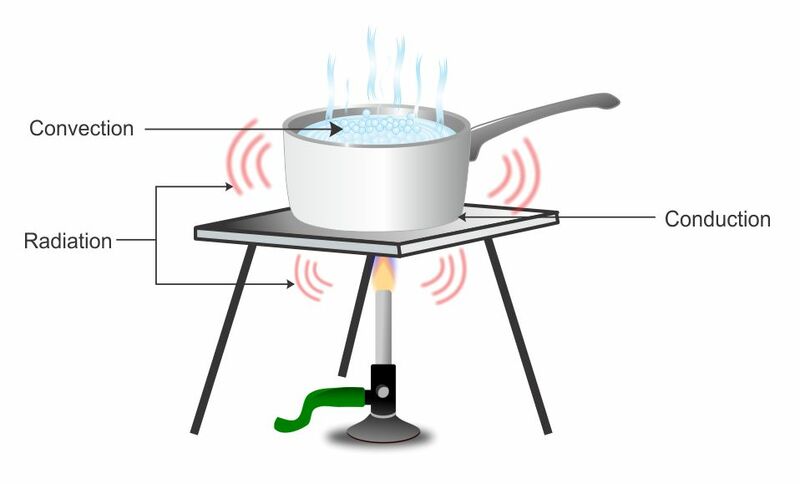 Concept insight: As copper is better conductor of heat than stainless steel so the heat from the flame is transferred quickly and more effectively through the copper bottom to the contents of the pan. TopperLearning provides step-by-step solutions for each question in each chapter in the NCERT textbook. Access Chapter 4 - Heat here for free.